Rūmī (1207 – 17 December 1273) was a 13th-century Persian poet, jurist, Islamic scholar, theologian, and Sufi mystic Rumi’s influence transcends national borders and ethnic divisions: Iranians, Tajiks, Turks, Greeks, Pashtuns, other Central Asian Muslims, and the Muslims of South Asia have greatly appreciated his spiritual legacy for the past seven centuries. His poems have been widely translated into many of the world’s languages and transposed into various formats. Rumi has been described as the “most popular poet” and the “best selling poet” in the United States, among Muslims. 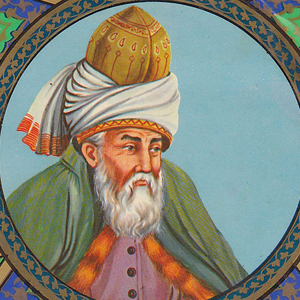 Rumi’s works are written mostly in Persian, but occasionally he also used Turkish, Arabic, and Greek, in his verse. His Mathnawī, composed in Konya, may be considered one of the purest literary glories of the Persian language. His works are widely read today in their original language across Greater Iran and the Persian-speaking world.